People who abuse particularly vulnerable members of a household such as children, elderly parents or grandparents, or disabled individuals often have a history of animal cruelty. In 80% of all child abuse cases, there is also a history of animal abuse. Many of those who harm children and animals have also suffered abuse in their own childhoods. Threats against domestic pets may be used to manipulate or coerce children. Even if not directly abused themselves, children who witness animal abuse are more inclined to be cruel to animals and other people. They may engage in bullying behaviours with smaller children or become emotionally withdrawn, depressed, or anxious. 60-71% of battered women reported that their abusive partners threatened, harmed, or murdered their pets, and the majority of these incidents occurred in front of the women and/or their children. 25-48% of those subjected to domestic violence delayed leaving their abusive partners for fear of what they would do to their pets. Those in abusive situations, when making their escape, should arrange to have their pets stay with friends or family members, call their local SPCA to find temporary foster homes, or make other arrangements, such as boarding at a local kennel, if they can’t take their pets with them. Animal cruelty is one of the early markers of psychopathic personality disorder (also known as sociopathic personality disorder). Most serial killers and many other violent criminals have a history of animal abuse, with animals often being used as a “rehearsal” for later crimes against people. Those who abuse animals in childhood are statistically far more likely to commit violent crimes when they reach adulthood. While such acts may be excused as normal childhood behaviour at the time, they are not. Deliberate violence toward animals is considered a red flag for future violent behaviour toward humans and other criminal acts. 23% of those arrested in Chicago on animal abuse charges were subsequently arrested for felony offenses. 35% of Chicago search warrants for dogfighting or other animal abuse led to weapons and narcotics seizures. 70% of Massachusetts animal abusers also had a history of violent crime, drug abuse, and other problems. 70% of those charged with animal cruelty in Winnipeg, Canada, had a history of violent behaviour, and some had even committed homicides. 82% of those arrested for abusing animals in Chicago had prior convictions for weapons offenses, battery, or drugs. 100% of those who committed sexual homicides in Sydney, Australia, had a self-reported history of cruelty to animals. Animal cruelty is not usually an isolated form of violence. Rather, it indicates a violent nature, and the people who engage in it are likely to harm people as well. As such, acts of animal cruelty should be taken very seriously, not only to protect animals, but also because of the risk to people. In addition to fostering a climate of nonviolence both in educational institutions and the broader community, educating people on the link between violence toward animals and cruelty to people can help to break the cycles of violence. There are a number of resources available for learning about the connection, and for obtaining help in dealing with abuse. To report abuse of your pet or any other animal, call your local SPCA. In Canada, the number can be found in the phone directory under Society for the Prevention of Cruelty to Animals. 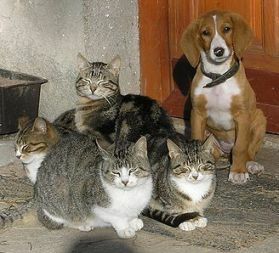 In the United States, see the American Society for the Prevention of Cruelty to Animals’ Report Animal Cruelty webpage. For further information regarding the connection between family violence and cruelty to animals, contact the BC SPCA’s Education Division: 1-800-665-1868. To obtain help in dealing with family violence, see Domestic Violence International Resources for organizations and crisis hotlines. For a full list of psychology articles, see the main Psychology page. For more animal articles, see the main Animals page. Alberta SPCA. “Animal Cruelty and Family Violence.” AlbertaSPCA.org. American Humane Association. “Quick Facts: Why is the Link Important for Law Enforcement?” and “Quick Facts: Why is the Link Important for Domestic Violence?” AmericanHumane.org. Ontario SPCA. “Violence Prevention” Fact Sheet. OSPCA.BruceGrey.ca/violenceprev.pdf.